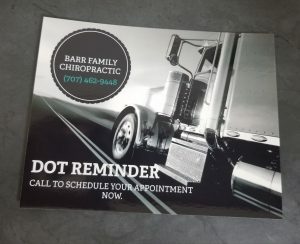 Barr Family Chiropractic offers DMV physicals at a much lower cost and quicker appointment time. Both of our doctors are Certified Medical Examiners and often can get you in the same day. If you have blood pressure problems or just a case of white coat syndrome don’t worry, we accommodate with a mellow office and a nice massage chair to calm those nerves. Please give us a call to schedule your appointment.